Law Web: Whether a document can be termed as invalid merely because it is written on two stamp papers purchased by same person on different dates? Whether a document can be termed as invalid merely because it is written on two stamp papers purchased by same person on different dates? The Stamp Rules in many States provide that when a person wants to purchase stamp papers of a specified value and a single stamp paper of such value is not available, the stamp vendor can supply appropriate number of stamp papers required to make up the specified value; and that when more than one stamp paper is issued in regard to a single transaction, the stamp vendor is required to give consecutive numbers. In some States, the rules further require an endorsement by the stamp vendor on the stamp paper certifying that a single sheet of required value was not available and therefore more than one sheet (specifying the number of sheets) have been issued to make up the requisite stamp value. But the Indian Stamp Rules, 1925 applicable to Tamil Nadu, do not contain any provision that the stamp papers of required value should be purchased together from the same vendor with consecutive serial numbers. The Rules merely provide that where two or more sheets of paper on which stamps are engraved or embossed are used to make up the amount of duty chargeable in respect of any instrument, a portion of such instrument shall be written on each sheet so used. No other Rule was brought to our notice which required use of consecutively numbered stamp papers in the State of Tamil Nadu. The Stamp Act is a fiscal enactment intended to secure revenue for the State. In the absence of any Rule requiring consecutively numbered stamp papers purchased on the same day, being used for an instrument which is not intended to be registered, a document cannot be termed as invalid merely because it is written on two stamp papers purchased by the same person on different dates. Even assuming that use of such stamp papers is an irregularity, the court can only deem the document to be not properly stamped, but cannot, only on that ground, hold the document to be invalid. Even if an agreement is not executed on requisite stamp paper, it is admissible in evidence on payment of duty and penalty under section 35 or 37 of the Indian Stamp Act, 1899. If an agreement executed on a plain paper could be admitted in evidence by paying duty and penalty, there is no reason why an agreement executed on two stamp papers, even assuming that they were defective, cannot be accepted on payment of duty and penalty. But admissibility of a document into evidence and proof of genuineness of such document are different issues. R.V. Raveendran and P. Sathasivam, JJ. Citation: AIR 2008 SC 1541. 1. This appeal by special leave is by the plaintiff in a suit for specific performance - OS No.290/1980 on the file of District Munsiff, Tindivanam. 2. In the plaint, the plaintiff (appellant) alleged that the first defendant (Adilakshmi) agreed to sell the suit schedule property to him under an agreement of sale dated 5.1.1980 for a consideration of Rs.3,000/-, and received Rs.2,000/- as advance. She agreed to execute a sale deed by receiving the balance consideration of Rs.1,000/- within three months. Possession of the suit property was delivered to him, under the said agreement. He issued a notice dated 14.2.1980 calling upon the first defendant to receive the balance price and execute the sale deed. The first defendant sent a reply denying the agreement. To avoid performing the agreement of sale, the first defendant executed a nominal sale deed in regard to the suit property in favour of the second defendant (first respondent herein), who was her close relative. The said sale was neither valid nor binding on him. On the said averments, he sought specific performance of the agreement of sale, against the defendant, alleging that he was ready and willing to perform his part of the contract. 5. On the said pleadings, three issues were framed by the trial court: (i) whether the agreement put forth by the plaintiff was true or concocted ? (ii) whether the second defendant had purchased the suit property for valid consideration ? and (iii) whether the plaintiff was entitled to the relief of specific performance ? The plaintiff examined himself as PW-1 and the scribe of the agreement (Ramaswami Pillai) as PW-2 and an attesting witness to the sale agreement (Venkatesha Pillai) as PW-3. The agreement of sale was exhibited as Ex. A-1. The notice and reply were marked as Ex. A2 and A4. The second defendant, (purchaser of the site), gave evidence as DW-1 and the third defendant, who was also a witness to the sale deed dated 11.2.1980, was examined as DW-2. The sale deed dated 11.2.1980 executed by first defendant in favour of second defendant was marked as Ex.B2 and previous title deed was exhibited as Ex. B4. The plaintiff and his witnesses gave evidence that the sale agreement was duly executed by first defendant in favour of plaintiff. The defendants gave evidence about the sale in favour of second defendant and denied execution of any agreement of sale in favour of plaintiff. (ii) A perusal of the agreement (Ex.A1) showed that the thumb impression was very pale and not clear. The first appellate court could not, by a casual comparison of the disputed thumb impression in the agreement with the admitted thumb impression in the sale deed, record a finding that there were no marked differences in the thumb impressions in the two documents (Ex.A1 and Ex.B2). In the absence of an expert's opinion that the thumb impression on the agreement of the sale was that of the first defendant, the first appellate court ought not to have concluded that the agreement of sale was executed by the first defendant. (iv) The attesting witnesses to the agreement of sale were close relatives of plaintiff. Their evidence was not trustworthy. 9. The said judgment of the High Court is challenged in this appeal by special leave. The appellant contended that having regard to the provisions of Evidence Act, 1872, there was nothing improper in the first appellate court comparing the disputed thumb impression in Ex. A-1 with the admitted thumb impression of first defendant in Ex. B-2; and the finding of the first appellate court on such comparison, that there were no marked differences between the two thumb impressions, being a finding of fact, was not open to interference in second appeal. It was next contended that the execution of the agreement of sale was duly proved by the evidence of plaintiff (PW1), the scribe (PW-2) and one of the attesting witnesses (PW3). It was pointed out there was no evidence to rebut the evidence of PW1, PW2 and PW3 regarding due execution as first defendant died without giving evidence, and as the defendants did not seek reference to a finger print expert to prove that the thumb impression on the agreement of sale was not that of first defendant. It was submitted that an agreement cannot be doubted or invalidated merely on account of the fact that the two stamp papers used for the agreement were purchased on different dates. The Appellant therefore submitted that the sale agreement was duly proved. (iii) Whether the High Court erred in reversing the judgment of the first appellate court in second appeal? 11. The Trial Court and the High Court have doubted the genuineness of the agreement dated 5.1.1980 because it was written on two stamp papers purchased on 25.8.1973 and 7.8.1978. The learned Counsel for first respondent submitted that apart from raising a doubt about the authenticity of the document, the use of such old stamp papers invalidated the agreement itself for two reasons. Firstly, it was illegal to use stamp papers purchased on different dates for execution of a document. Secondly, as the stamp papers used in the agreement of sale were more than six months old, they were not valid stamp papers and consequently, the agreement prepared on such 'expired' papers was also not valid. We will deal with the second contention first. The Indian Stamp Act, 1899 nowhere prescribes any expiry date for use of a stamp paper. 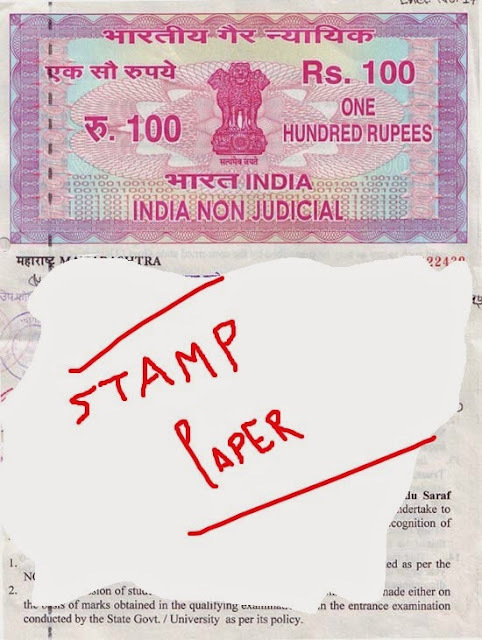 Section 54 merely provides that a person possessing a stamp paper for which he has no immediate use (which is not spoiled or rendered unfit or useless), can seek refund of the value thereof by surrendering such stamp paper to the Collector provided it was purchased within the period of six months next preceding the date on which it was so surrendered. The stipulation of the period of six months prescribed in Section 54 is only for the purpose of seeking refund of the value of the unused stamp paper, and not for use of the stamp paper. Section 54 does not require the person who has purchased a stamp paper, to use it within six months. Therefore, there is no impediment for a stamp paper purchased more than six months prior to the proposed date of execution, being used for a document. 14. Section 45 of the Indian Evidence Act, 1872 relates to 'opinion of experts'. It provides inter alia that when the court has to form an opinion as to identity of handwriting or finger impressions, the opinion upon that point of persons specially skilled in questions as to identity or handwriting or finger impressions are relevant facts. Section 73 provides that in order to ascertain whether a finger impression is that of the person by whom it purports to have been made, any finger impression admitted to have been made by that person, may be compared with the one which is to be proved. These provisions have been the subject matter of several decisions of this Court. Although there is no legal bar to the Judge using his own eyes to compare the disputed writing with the admitted writing, even without the aid of the evidence of any handwriting expert, the Judge should, as a matter of prudence and caution, hesitate to base his finding with regard to the identity of a handwriting which forms the sheet-anchor of the prosecution case against a person accused of an offence, solely on comparison made by himself. It is therefore, not advisable that a Judge should take upon himself the task of comparing the admitted writing with the disputed one to find out whether the two agree with each other; and the prudent course is to obtain the opinion and assistance of an expert. The section does not specify by whom the comparison shall be made. However, looking to the other provisions of the Act, it is clear that such comparison may either be made by a handwriting expert under Section 45 or by anyone familiar with the handwriting of the person concerned as provided by Section 47 or by the Court itself. As a matter of extreme caution and judicial sobriety, the Court should not normally take upon itself the responsibility of comparing the disputed signature with that of the admitted signature or handwriting and in the event of the slightest doubt, leave the matter to the wisdom of experts. But this does not mean that the Court has not the power to compare the dispute signature with the admitted signature as this power is clearly available under Section 73 of the Act. The argument that the court should not venture to compare writings itself, as it would thereby assume to itself the role of an expert is entirely without force. Section 73 of the Evidence Act expressly enables the court to compare disputed writings with admitted or proved writings to ascertain whether a writing is that of the person by whom it purports to have been written. If it is hazardous to do so, as sometimes said, we are afraid it is one of the hazards to which judge and litigant must expose themselves whenever it becomes necessary. There may be cases where both sides call experts and the voices of science are heard. There may be cases where neither side calls an expert, being ill able to afford him. In all such cases, it becomes the plain duty of the court to compare the writings and come to its own conclusions. The duty cannot be avoided by recourse to the statement that the court is no expert. Where there are expert opinions, they will aid the court. Where there is none, the court will have to seek guidance from some authoritative textbook and the court's own experience and knowledge. But discharge it must, its plain duty, with or without expert, with or without other evidence. The decision in Murari Lal (supra) was followed in Lalit Popli v. Canara Bank and Ors. MANU/SC/0144/2003 : (2003)IILLJ324SC . 15. While there is no doubt that court can compare the disputed handwriting/signature/finger impression with the admitted handwriting/ signature/finger impression, such comparison by court without the assistance of any expert, has always been considered to be hazardous and risky. When it is said that there is no bar to a court to compare the disputed finger impression with the admitted finger impression, it goes without saying that it can record an opinion or finding on such comparison, only after an analysis of the characteristics of the admitted finger impression and after verifying whether the same characteristics are found in the disputed finger impression. The comparison of the two thumb impressions cannot be casual or by a mere glance. Further, a finding in the judgment that there appeared to be no marked differences between the admitted thumb impression and disputed thumb impression, without anything more, cannot be accepted as a valid finding that the disputed signature is of the person who has put the admitted thumb impression. Where the Court finds that the disputed finger impression and admitted thumb impression are clear and where the court is in a position to identify the characteristics of finger prints, the court may record a finding on comparison, even in the absence of an expert's opinion. But where the disputed thumb impression is smudgy, vague or very light, the court should not hazard a guess by a casual perusal. The decision in Muralilal (supra) and Lalit Popli (supra) should not be construed as laying a proposition that the court is bound to compare the disputed and admitted finger impressions and record a finding thereon, irrespective of the condition of the disputed finger impression. When there is a positive denial by the person who is said to have affixed his finger impression and where the finger impression in the disputed document is vague or smudgy or not clear, making it difficult for comparison, the court should hesitate to venture a decision based on its own comparison of the disputed and admitted finger impressions. Further even in cases where the court is constrained to take up such comparison, it should make a thorough study, if necessary with the assistance of counsel, to ascertain the characteristics, similarities and dissimilarities. Necessarily, the judgment should contain the reasons for any conclusion based on comparison of the thumb impression, if it chooses to record a finding thereon. The court should avoid reaching conclusions based on a mere casual or routine glance or perusal. 16. In this case the first defendant had denied having put her finger impression on Ex. A-1. She died during the pendency of the suit before her turn came for giving evidence. The High Court having examined the document has clearly recorded the finding that the thumb mark in Ex. A-1 was pale (that is light) and not clear. The document though dated 1980, was executed on two stamp papers which were purchased in 1973 and 1978. Contrary to the recital in the agreement that possession had been delivered to the plaintiff, the possession was not in fact delivered to plaintiff, but continued with the first defendant and she delivered the possession to the second defendant. The title deeds were not delivered to plaintiff. The attesting witnesses were close relatives of plaintiff and one of them was not examined. The scribe's evidence was unsatisfactory. It was also difficult to believe that the first defendant, an illiterate old woman from a village, would enter into an agreement of sale on 5.1.1980 with plaintiff, and even when he is ready to complete the sale, sell the property to someone else hardly a month thereafter, on 11.2.1980. In this background, the finding by the first appellant court, recorded without the benefit of any expert opinion, merely on a casual perusal, that there appeared to be no marked differences between the two thumb impressions, and therefore Ex. A-1 (sale agreement) must have been executed by first defendant, was unsound. The High Court was justified in interfering with the finding of the first appellate court that the Ex.A1 was executed by first defendant. 17. The trial court had analyzed the evidence properly and had dismissed the suit by giving cogent reasons. The first appellate court reversed it by wrongly placing onus on the defendants. Its observation that when the execution of an unregistered document put forth by the plaintiff was denied by the defendants, it was for the defendants to establish that the document was forged or concocted, is not sound proposition. The first appellate court proceeded on the basis that it is for the party who asserts something to prove that thing; and as the defendants alleged that the agreement was forged, it was for them to prove it. But the first appellate court lost sight of the fact that the party who propounds the document will have to prove it. In this case plaintiffs came to court alleging that the first defendant had executed an agreement of sale in favour. The first defendant having denied it, the burden was on the plaintiff to prove that the first defendant had executed the agreement and not on the first defendant to prove the negative. The issues also placed the burden on the plaintiff to prove the document to be true. No doubt, the plaintiff attempted to discharge his burden by examining himself as also scribe and one of the attesting witnesses. But the various circumstances enumerated by the trial court and High Court referred to earlier, when taken together, rightly create a doubt about the genuineness of the agreement and dislodge the effect of the evidence of PW 1 to 3. We are therefore of the view that the decision of the High Court, reversing the decision of the first appellate court, does not call for interference. We, therefore, find no merit in this appeal and the same is accordingly dismissed. Parties to bear their respective costs.